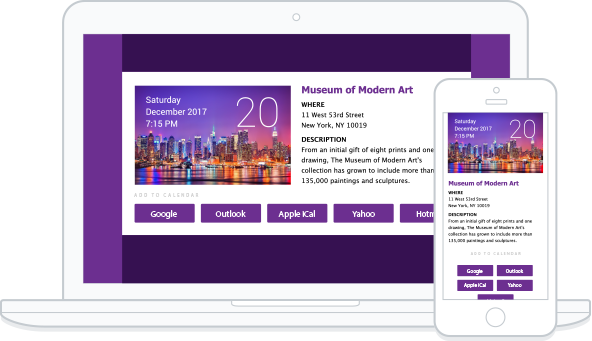 Campayn’s new Add to Calendar feature is a convenient tool that helps your email recipients keep track of dates for your upcoming events, sales, promotions, and more. With the click of a button, your contacts can add the date, location, and a description of your company’s events to their Google, Outlook, Apple iCal, Yahoo, or Hotmail calendar. This exciting new feature is seamlessly integrated into Campayn’s email templates — so there’s no extra plug-ins or coding needed. Just drag and drop. It’s that simple. Give students and parents an easy way to add important school meetings and class schedules to their calendar. Help clients remember conference calls, webinars and the other time-sensitive events you host. Remind your audience to come back to your store for special promotions, holidays and events. Allow teams and fans to add important practices, game days and events to their calendar.